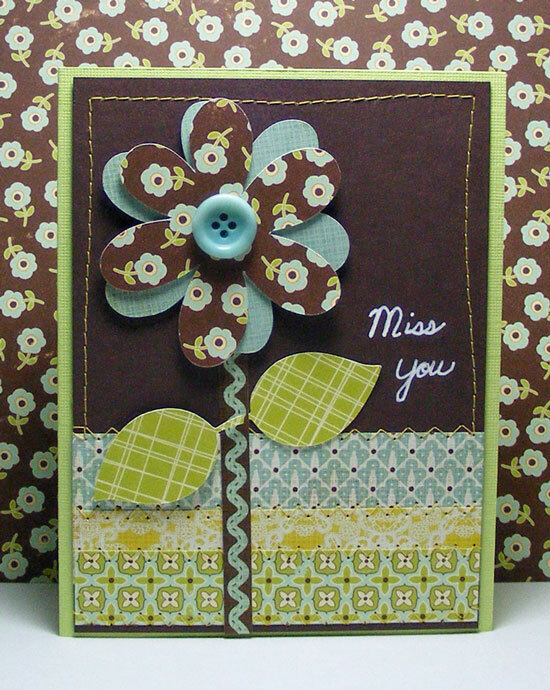 Do you ever get a design stuck in your head and you just can't do anything else until you create that card or layout? I got this idea for using more of the Farm Fresh papers. I put the Cricut to work Sunday quickly cutting out some flowers and leaves using the Accent Essentials cartridge. 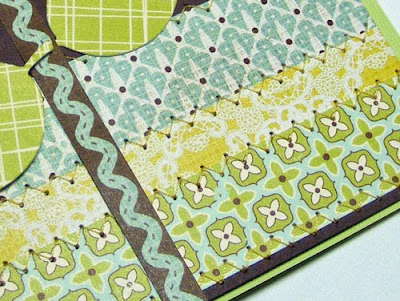 The paper strips are sewn on with zig zag stitching to add to the homey feel of these papers. The designer papers are from two collections from two different publishers that actually coordinate really well - October Afternoon's Farm Fresh and Basic Grey's Nook and Pantry. I'm using the paper packs so the scale of the prints is smaller and really suitable for cards. The chocolate chip cardstock is Stampin' Up!